Add £50 to this order to pay in easy instalments. All orders are sent using Royal Mail’s tracked delivery service. Orders placed before 4pm (Monday-Friday) are dispatched the same day, 11am Saturday. Sunday orders are dispatched on the following Monday. WatchNation offers a returns policy for watches/jewellery ordered through our website. So long as the item is unworn with it's original packaging, brand tag & warranty it can be returned for a full refund. We are confident that our watch prices are the lowest that you will find in the UK. However, in case you find exactly the same watch at a lower price elsewhere, we will offer you the opportunity to purchase the watch at that lower price from WatchNation. Please include a link to where you found the product on sale for a lower price. Thanks for letting us know about the product you found for a cheaper price. We'll look into it straight away and match the price if we can! We only price match against UK based web sites. We only price match with other official watch dealers. We do not price match with eBay listings, second hand goods or imports from the grey market. We cannot price match with clearance or liquidation sales. Although we make every effort to offer you the best possible price, we reserve the right to refuse any price match request for any reason. It's important that your watch fits your wrist comfortably and looks great at the same time. Leather strap watches tend to fit without a problem for most wearers. However, watches fitted with metal bracelets often need adjusting to get the perfect fit. This is generally a very simple procedure. We can do this for you, or you can get the watch adjusted locally. When purchasing a watch which has a metal bracelet with adjustable links, we will gladly adjust the watch bracelet to fit your wrist before sending the watch to you - free of charge! Simply type your wrist measurement (in inches or centimetres) into the bracelet size section of the checkout and we will ensure the watch bracelet is adjusted accordingly before being sent to you. We will include all the surplus links, with the watch. You should allow about half a centimetre (1/4 inch) of slack to prevent it being too tight on your wrist. In the event of you needing an extra-long wrist bracelet, which requires an extension to the original watch, we must obtain extra links from the manufacturer, and in this event, we will contact you to inform you of any possible delays or applicable charges. Watches with bracelets adjusted by WatchNation are still eligible under our refund policy. If you wish, you can have it adjusted locally by another jeweller or key cutter. However, you will have to cover the cost of this option yourself. WatchNation is proud to be an authorised and official UK retailer of watches/jewellery. We stock a broad and exciting range of these superb watches/jewellery both online and in store. You can visit us at 15-17 Charles Street, Hoole, Chester, CH2 3AZ. This gives you the opportunity to take a first-hand look at our fantastic range of high-quality timepieces, with our friendly team of staff always on hand to use their decades of experience to offer helpful advice, useful information and expert guidance. If you can’t pay a visit to our store, then our online delivery service guarantees that your latest timepiece will go from checkout to your wrist in a fast and reliable manner. These services are all a product of the motto on which WatchNation was founded and will forever operate – “Time for the People”. 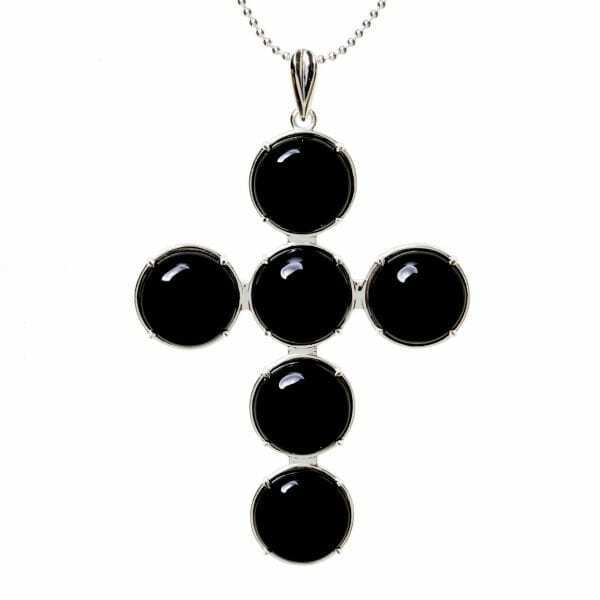 Sleek and stylish, this Kim Minchin Onyx Cross Large Necklace is a must have for any occasion. The cross pendant is approximately 6cm by 9cm in size with the chain being 80cm. The necklace is made from 925 Sterling Silver and black onyx. Kim Minchin Jewellery was founded back in 2014 by well known designer Kim Minchin Dunn. The philosphy of the brand centres around being able to wear any piece at any time. Having grown a loyal following from influencers and celebrities, this jewellery is a must have. WatchNation is a company registered in England and Wales at 15-17 Charles Street, Hoole, Chester, CH2 3AZ, number 09989944. VAT number 244321143.